Articles The Curve Evolution – How we helped boxers run faster!! 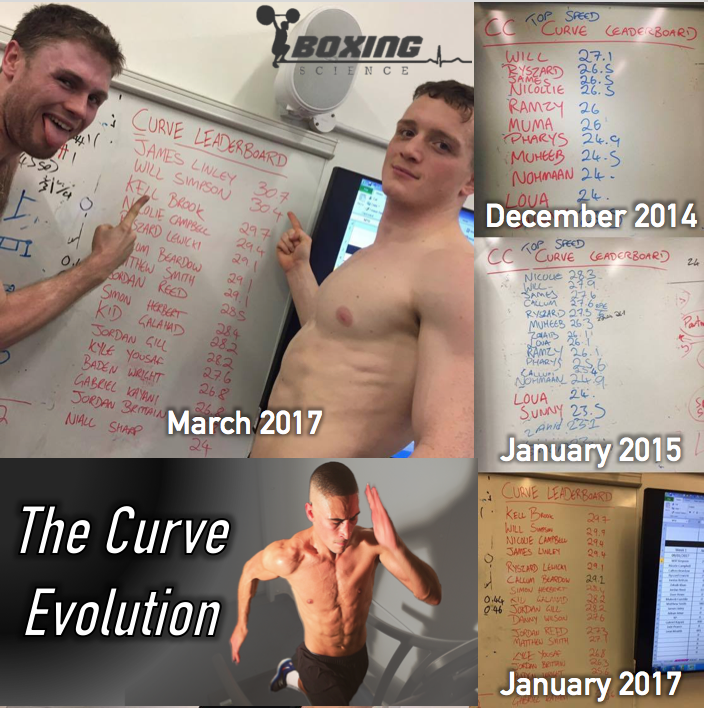 The Curve Evolution – How we helped boxers run faster!! Strength and Conditioning coach Danny Wilson explains how he improved boxers maximum sprint speed by 16% in under TWO years. As a sport, Boxing is evolving! The long road runs of yesterday are getting less popular as boxers and coaches start to embrace high-intensity interval training. The reason why is because, more often than not, a successful boxer will need to throw hundreds of forceful punches, in blistering combinations, and at a high work-rate over several three minute rounds. This means that Boxing is a sport of repeated high intensities. At Boxing Science, we look to improve a boxers upper-limit to intensity and their ability to repeat or endure these. The best piece of kit to use for this is the woodway curve treadmill…. ‘The Curve’ is a ‘C-shaped’ non-motorised treadmill which is powered solely by the user’s legs. The Woodway’s rubberized slat running surface absorbs shock at the point of impact, this running surface has the ideal ‘softness’ to eliminate the harmful shock to joints and connective tissues. This requires increased activation of large muscle groups in the legs. With no set tempo or restriction on speed, this promotes propulsive actions and maximum effort from users, resulting in improved sprinting speed. This also allows us to manipulate programs, create brutal conditioning sessions and accurately target different adaptations. Impact: Our boxers are getting fitter and faster with reduced likelihood of injury through repetitive high impact forces. When we first started the Boxing Science sessions in 2014, we have been working towards a curve max speed record that seemed to be eluding us…. The 29.7 km/h record was set by Kell Brook in preparation for his world title fight against Shawn Porter in August 2014. During this time, the amateur and aspiring professional boxers were just starting hitting speeds of 22-23 km/h. After a few cycles of repeated sprint training blocks, I knew that we was close to the elusive 29.7…… so we switched on the heat!! Amateur boxers James Linley and Will Simpson battled it out in the heat for first place! Simpson took the lead and was first to break the 30 barrier with a stunning 30.4 km/h max speed. Just 60 seconds later, James catapulted to an incredible 30.7 km/h sprint!!! It’s not just these two that have shown massive improvements…. take a look at the improvements from some of the boxers. The Curve Evolution – How Did We Do It???? First of all, the most consistent and hard working boxers have made the biggest improvements. A quality program is made pretty average if the athlete gives half of the effort or attends half of the sessions. The improvements have been made over a relatively long time, so writing up every phase would take me months and you probably wouldn’t want to read it…. so here are a few things we implemented to unlock SPEED. Using excel templates on Ipads / Macbooks, we record speeds at regular time intervals to set sprint trends, determine performance in comparison to max speed and calculate session loads. This allows us to set targets session by session, rep by rep. Setting these targets makes sure the boxer know exactly what’s expected of them in comparison to their previous scores. We also provide feedback on how much a boxer has improved, or on what the area of fitness they need to improve on. After a few below-par performances on the curve (black lines), we had to review his diet, training and recovery. We altered one of his sessions to a recovery / speed training session to reduce his training load to improve the quality of the sessions. Also, we altered the program to unlock his maximal running speed using 10-20 second sprint clusters. Impact – Callum has improved his upper-capacity, repeatability and endurance of high-intensity performance….. The results showed in his last bout!! Warmer temperatures can help increase muscle elasticity and force production during repeated sprint training. So, when we have to manipulate the intensity of our training, we turn up the environmental chamber to 36-40 degrees Celsius. In our recent training block, using the heat has improved the maximum speed performed by 4%, a massive increase in intensity. We have said before how our favourite way to condition boxers are the 30 second maximal sprints with 3-4 minutes recovery. However, there are only so many times we can repeat these to keep improving and avoid stagnation. There are two ways we can variate these sessions, by manipulating the volume or intensity…… OR BOTH! To achieve this, we use Sprint Clusters of either 20, 15 or 10 seconds, split up by a short recovery. This helps increase the intensity even when we are looking to increase the volume, a great example of this are our 20 second sprints. Comparing a session based off 120 seconds of running, the 20-20’s increase total session load by a massive 27%. This can help massively with progressive overload. However, if you liked this article, you will be amazed by this presentation! The Future of Boxing Conditioning – Performance physiologist Alan Ruddock will be sharing the science behind conditioning an athlete. You will learn the underpinning science that goes into programming and monitoring that Alan has used to get world-level athletes into the shape of their lives.